As the manager and booking agent for Atlanta’s famous Castle Rock concert venue, Amelia “Ame” Grace is ready for the most exciting week of her career: she’s booked three shows and a live DVD-filming for the comeback tour of none other than the eighties Pop Rock Prince himself, Bobby Glitter! Before the rock star can take a bow on the first night, however, trouble steals the show as Castle Rock’s owner takes a deadly tumble from atop the venue’s rear tower. 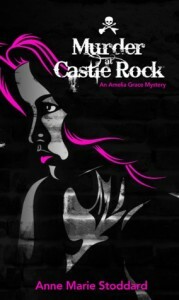 To make matters worse, the police suspect foul play—and all signs point to two of Castle Rock’s own employees. Ame is in a race against time to clear the names of her friends and uncover the truth before the killer decides it’s curtains for her too! The setting for this cozy mystery was a concert venue in an older building that resembled a castle. I loved the setting with the different levels of the building and the names that the author gave to each. It was unique in I hadn't read any books lately with the rock and roll theme to it. I love cozy mysteries because I can be a sleuth and try to figure out ahead of time who dunit.. without feeling scared like in a thriller. The author did a good job at keeping me guessing who the killer was, yet at the same time throwing out hints. The main characters had good depth to them. I enjoyed Ameila and Kat's characters as I could watch them grow in compassion for each other and the people who worked with them. I did get confused a little bit with the amount of secondary characters between the interviewer and his cohorts, the investigation crew, and Bobby Glitter's entourage. There was a bit of language and sexual implications and drug use. Aside from my friends and family, I’m passionate about two things: writing and live music. When I can bring the two together, my life feels complete. I hadn’t written fiction since 6th grade until 2011 (because, of course, I’d replaced this creative outlet with live music performance while I played the saxophone from 6th grade through the end of college). I was fortunate enough to win the 2012 AJC Decatur Book Festival & BookLogix Publishing Services, Inc. Writing Contest with my manuscript for “Murder At Castle Rock,” and as a result, the novel will be published in March 2013. Being published has been a dream of mine since I began writing stories about the Easter Bunny in kindergarten–so, needless to say, I am beside myself with joy over this opportunity! I am currently working on several other projects, including a sequel to “Murder At Castle Rock” and another mystery series that takes place in the art world. This book is the first in the Amelia Grace music industry thriller series and was the winner of the 2012 AJC Decatur Book Festival & BookLogix Publishing Services, Inc. Writing Contest. I love a good mystery, but don't like bad language in them. Thanks for the review. Thank you for the honest and thoughtful review, Melanie! 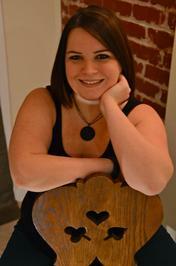 I appreciate you hosting my book on your blog. Have a wonderful rest of your week!